Everything you wanted to know about Skedaddle Kids but were afraid to ask – if you can’t find what you are looking for please ask! Skedaddle Kids will be closed Saturday July 1st, 2017 for Canada Day! We will be open again on Sunday July 2, 2017 at 10AM. We hope to see you then 🙂 Have a wonderful Canada Day with your family! Come spend the Easter weekend with the entire family at Skedaddle Kids! Easter Weekend Hours: Friday April 14, 2017 (GOOD FRIDAY) – 10:00AM TO 7:00PM Sunday April 16, 2017 (EASTER) – 10:00AM TO 6:00PM Monday April 17, 2017 (EASTER MONDAY) – 10:00AM TO 7:00PM We hope to see you then! Happy Easter from all of us at Skedaddle Kids! We are open on FAMILY DAY from 10:00am to 7:00pm! 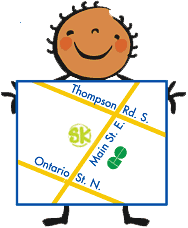 skedaddle kids inc. indoor play centre is an unsupervised facility. Parents and guardians must be present to supervise their children at all times. No toys are allowed outside of the toddler area and balls must remain in the ball cage. 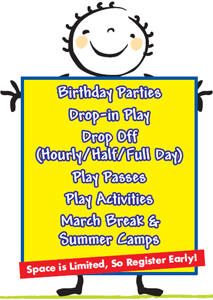 Let Skedaddle Kids host your child’s birthday party at our indoor playground facility so you can enjoy the celebration too! No playing host and no clean-up — we do it all. We want your party to be memorable, exciting, and worry-free for everyone.